The Jamba Juice Fundraiser is a great idea that is purely for American PTA's (Parent Teacher Associations). It works really simply and is a great way to raise funds continually without having to constantly drive the fundraiser! If you are a PTA with a Jamba Juice shop in your area than a this fundraiser is definitely worth doing! How it works is you will hand out Jamba Juice Cards, made specifically for your PTA, to all your members and supporters. Then every time those people buy some healthy fruit juice from Jamba Juice and show their PTA appreciation cards, your PTA will receive 10% of that purchase and a further 2% will go to the national PTA. You can also organize with your local Jamba Juice store to come out to your events, with a juice stand and you will earn the same percentage commission on sales! Your first step will be to register with the Jamba Juice PTA appreciation program. You can do that by visiting the Jamba Juice Fundraiser site here. It's a simple process that shouldn't take you very long! The next step will be to advertise your Jamba Juice Fundraiser Cards and hand them out to willing participants! You should encourage every kid, parent, teacher or supporter to take a card and to use it when they buy their healthy fruit juice. You should also promote Jamba Juice and the benefits of it. Jamba Juice is obviously a very healthy alternative to fast foods or ice creams etc. and it's a great way to promote healthy eating at your School! It will be important to advertise this fundraiser so that everyone knows that the cards are available and that they can help fundraise for your PTA by using them. Make announcements at School assemblies and get all the teachers to make further announcements in class. Send home flyers with the kid's. Ask local businesses to support you by placing posters on their walls and handing out flyers to customers and employees! Post about the fundraiser on your Fundraising Website and leave details on how people can obtain the appreciation cards. Announce in your newsletters. Both Online and Offline. Post on your Facebook page and Tweet about it through your Twitter account! Use all your other Social Media networks to. And through all of that you should create some good "Word Of Mouth Buzz"!!! To find out more about raising good publicity I would recommend you read Jack Atwell's book Let's Raise Money! And for more ideas on promoting a fundraiser read here. As long as people remember to show their cards whenever they purchase at Jamba Juice!!! So you must, through the year, continue to remind people about their cards! So use the above advertising methods to continue to remind people that whenever they go to Jamba Juice they must use your fundraiser cards to purchase with and raise funds for your PTA. Remember that the Jamba Juice fundraiser can also be used at your events. 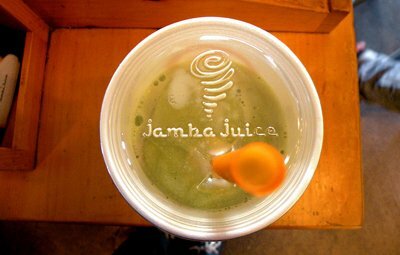 Get Jamba Juice to come out and sell their healthy products at your event and you will receive a percentage of the sales made! This is a really great PTA fundraising idea that I would recommend every Parent/Teacher Association uses! It's healthy... It's Simple... And it can continuously raise funds! For other food fundraising products have a look through this Free Fundraising Product Guide.